This story appears in the Sept. 21, 2015, issue of Sports Illustrated. Subscribe to the magazine here. Three or four nights a week this summer Ohio State junior quarterback Cardale Jones saw Braxton Miller's name pop up on his phone. Jones dragged himself out of bed, even when the texts arrived at 10 p.m., and made the 10-minute drive to the back entrance of the university's cavernous indoor football facility. A gate outside the Woody Hayes Athletic Center would mysteriously open, granting access to a garage door where Miller waited. Then Jones and Miller would drive in and park on the indoor field. By the time they exited their rides, the lights had been flipped on, Meek Mill blasted from the speakers and racks of footballs awaited. "I don't even know who he called," says Jones with a laugh, "to get the gate open and the music bumping." The covert conversion of Miller from Heisman-caliber quarterback to Heisman-candidate wide receiver played out in Columbus between May and July. Only a handful of players and coaches knew Miller's intentions, since he worked out much as he'd spent the previous year and a half—in the shadows. Miller did ladder drills, and then for an hour or so Jones threw while Miller ran routes and caught over-the-shoulder passes. "There was no one here," Miller says with a grin, "except maybe a couple of custodians." Two surgeries on his right shoulder forced the 6' 2", 215-pound Miller to miss the 2014 season and derailed his career as a QB. Despite being named the Big Ten MVP as a sophomore and as a junior, Miller faced an arduous fight for his old starting job this summer. His immediate replacement, sophomore J.T. Barrett, emerged as a star during the '14 regular season until he broke his right ankle against Michigan. Jones, who took over for Barrett, then led the Buckeyes to their eighth national championship. And Miller would have been battling from behind: The earliest he could have been medically cleared to throw was August. For the 20 months between in-game appearances—from January 2014 to September '15—Miller confronted the loneliness of rehab, the uncertainty of his professional future and the helplessness of seeing his teammates win the title without him. Miller had always been a bit introverted and aloof, but the time away created something strength coach Mickey Marotti says he hadn't seen in the early part of Miller's career: a chip on his shoulder. "It was like the injury changed him into a new man," receiver Michael Thomas says. "It brought a different demeanor out of him. It created a monster." 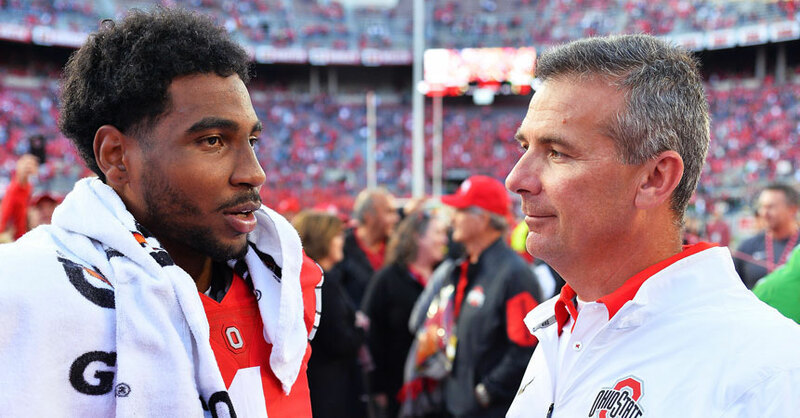 Miller first approached coach Urban Meyer about the switch in May, knowing that he needed to become a graduate-level receiver in one semester. He lost the 12 pounds he'd gained sitting out, learned the mano a mano gamesmanship of beating press coverage and studied film of similarly equipped receivers, like the Bills' Percy Harvin and the Rams' Tavon Austin. By the time he went public with the decision in late July, Miller already felt like a veteran. "I was so eager to get better at the position," Miller says. "I felt like I was behind. People have been doing this for years." After Miller rescued the No. 1 Buckeyes with two third-quarter touchdowns in their come-from-behind 42-24 opening win at Virginia Tech on Sept. 7, Meyer called Miller to the front of the locker room. While Miller's spontaneous pirouette on a 53-yard touchdown run had immediately gone viral, Meyer praised him more for his resilience than his improvisation. Miller responded by breaking down in tears as a conga line of Buckeyes hugged him. "He was overwhelmed with satisfaction and humility, and he was so thankful that it finally happened," says receivers coach Zach Smith. "He wanted it so bad." It marked the end of a nearly two-year journey during which Miller reshaped his career and identity. The most convoluted quarterback duel in college football began in January 2014, when Clemson defensive end Vic Beasley sacked Miller in the Orange Bowl. The hit injured Miller's shoulder, and he underwent labrum surgery before returning for training camp that August. He reinjured the shoulder throwing a seven-yard out in practice and underwent a second surgery later that month. No soothsayer could have predicted how events would unfold from there. Barrett went from unknown to indispensable, leading the Buckeyes to the cusp of the conference title. That allowed Jones to emerge as a third-string cult hero with victories in his first three starts—a 59-0 blowout of Wisconsin in the Big Ten title game and upsets of Alabama and Oregon in the College Football Playoff. The dazzling highlights showcasing Miller's 4.3 speed faded from memory. By the time his teammates hoisted the trophy as the inaugural College Football Playoff champs, most people assumed Miller's only option was a transfer. "It was hard times," Miller says. "J.T. was doing well, and people were saying they forgot about me. Then J.T. got hurt, and Cardale was doing good. Then they forgot about J.T." Miller says he heard rumors that he'd head to Alabama, LSU, Oregon and Florida State. (Barrett was supposedly going to Texas.) Fans tweeted him constant recruiting pitches. But Miller, who grew up in the Dayton area rooting for the Buckeyes, says he never considered leaving. When staff members would run the rumors by Miller, he would respond by rolling his eyes, shaking his head and reminding them of the giant script O tattoo that covers his left shoulder. "It's kind of outrageous at times," he says, reflecting on the rumors. "This is my home state. Good fan base. They've treated me right since I've gotten here. My goal was to graduate and go to the NFL from Ohio State." Miller earned his degree in communications last December and still hopes to achieve the second half of his goal. Marotti recalls asking Miller what countless fans and pundits had wondered during his career: "Do you see yourself as an NFL quarterback?" Miller, as Marotti recalls, responded, "Well, yeah. I want to play in the NFL." No one ever questioned Miller's running ability—in 2013 he set the school record for career rushing yards by a quarterback with 3,054—but he was unrefined as a passer. In his junior season, under then coordinator Tom Herman, Miller completed 63.5% of his passes, up from 54.1% as a freshman. But his shoulder injuries coincided with the NFL's waning interest in dual-threat quarterbacks like Tim Tebow, Robert Griffin III and Colin Kaepernick. During a trip to Birmingham in the spring to get checked by Dr. James Andrews, Miller found out he still wasn't ready to throw, but he was healthy enough to get back on the field. In Columbus he picked up the conversation with Marotti. "What do you think," Miller asked, "of me playing another position?" The spread offense that overtook college football in the 2000s can be traced back, in part, to No. 1 Nebraska's 27-24 overtime win at Notre Dame in '00. In the locker room after the game, Fighting Irish receivers coach Urban Meyer hugged his inconsolable star, David Givens. The wideout had caught one pass for nine yards. "He wasn't crying; he was sobbing," Meyer said. "His whole thing was that he let the team down." Meyer had recruited Givens, the nation's No. 1 prospect in 1998, and in the aftermath of the loss even he couldn't explain why an athlete so gifted had touched the ball so seldom. The coach says that moment spawned an off-season visit to then Louisville offensive coordinator Scott Linehan, who ran a spread passing game, in a quest to find ways to better exploit his playmakers. "That's the beginning," Meyer says, "of our offense." The image of Givens prompted Meyer to start a game-day tradition he still maintains: On the morning of kickoff he pulls out a fresh folder he'll keep with him on the sideline and asks himself a simple question: Who are my best players? He lists those names on the folder. Players such as Josh Harris (Bowling Green), Paris Warren (Utah) and Harvin (Florida) have had their names scribbled atop the folder over the years, and in an effort to get them the ball in space, Meyer has continued to add wrinkles. Stack the box, he'll hit a bubble screen. Double-team a star wideout, he'll run zone read. The playmakers' position doesn't matter. In years such as 2012, when the Buckeyes lacked perimeter options, the list was short. "Braxton was by far our best player," he says. "He had to run the ball 15 to 20 times for us to have a chance." Meyer planned to ease Miller into action at his new H-back position, which allows him to line up everywhere from the slot to the backfield to under center. But with three receivers suspended for the Virginia Tech game for violating team rules (Jalin Marshall, Corey Smith and Dontre Wilson) and projected sophomore starter Noah Brown injured, Miller played 31 of 56 snaps. (He didn't return punts, which he's expected to do this season.) Miller touched the ball eight times, and his performance illuminated the advances in Meyer's offense over the past 15 years. Miller caught three passes for 79 yards and a touchdown, took four Wildcats snaps and got one handoff for 61 rushing yards. "Ridiculous," Meyer says of Miller's potential. "He's got very good ball skills. He's strong. So much of it is, How much can his body take?" The opening weekend's defining highlight came when Miller reversed his field with a 360° spin past a pair of defenders, banishing them to GIF infamy. He also hauled in a 54-yard touchdown pass from Jones—the surprise starter—that included balletic footwork on the sideline to turn the corner. "Oh, for sure," Miller says when asked if he was eager to remind people of his talent. "I love football, especially when it's a prime-time game and the atmosphere is right. I want to put on a show." Miller did that, ensuring himself another season on Meyer's manila folder. Sitting at a circular cafeteria table in Ohio State's football facility in August, Miller FaceTimes with his three-year-old son, Landon, while noshing on chicken tenders and macaroni and cheese. The conversation helps Miller emerge from the sleepy haze that follows an hourlong massage, a treatment to help achy legs unaccustomed to the physical pounding that comes with playing receiver. Miller says his new position requires as much sprinting in a single session—Marotti says up to six miles—as a week of practice at quarterback. As a result, Miller's hamstrings and groin muscles tightened up during camp. "I knew it was coming," Marotti says of Miller's issues. "I knew the amount of running was going to really be a shock." What's impressed Buckeyes coaches most is Miller's aggressive effort to learn the technical part of the position. Smith, the cocksure 31-year-old receivers coach, has overseen the switch while graduate assistant Matt Merritt, 27, has served as something of a personal tutor. Meyer has tapped into his roots as a receivers coach, watching film regularly with Miller over the summer to talk about the nuances. To succeed, Miller needed to learn the every-snap, Spy vs. Spy interplay between receiver and defensive back that quarterbacks are generally oblivious to. In high school, for example, a receiver leans outside to fake a corner route and set up an inside cut for a post route. In college receivers will trick the defensive back by leaning the way they're actually going—or not. "It's like reverse, reverse psychology," Smith says. Good receivers line up with a plan to beat the defensive back on every snap, and the best use previous moves to set up a big shot downfield, such as running five corner routes on run plays to get the defensive back leaning outside, creating a clear path for a later post or slant. Miller laughs at the little things he's needed to learn: A receiver on the right side of the ball stands with his left foot forward, and vice versa. The footwork is also intricate; a veteran receiver can run a go, out or slant and disguise the routes by taking the same first three steps each time. "When they all look the same," says Buckeyes offensive coordinator Ed Warinner, "now you're winning." 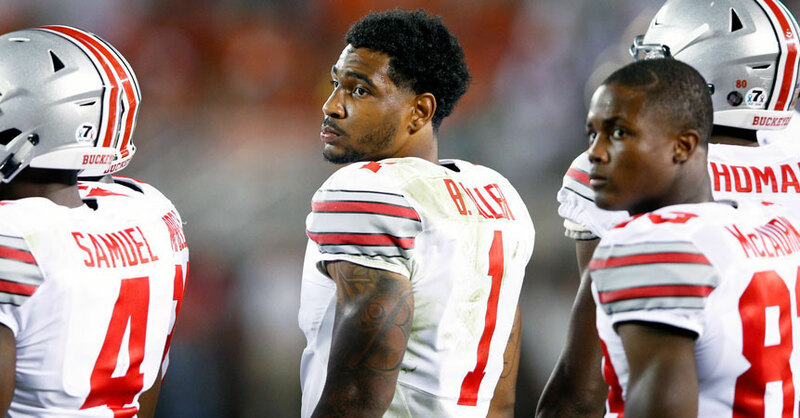 Every night during camp, Barrett says, Miller would return to the hotel more than an hour after the rest of the team. He stayed at the facility to watch film and pepper Merritt and Smith with questions about how to run sharper patterns and block better. Miller has no plans to return to his old position, saying, "This is me." "Now he's so into it, he doesn't know what to do with himself," Smith says. "He thinks it's the coolest thing in the world." After 20 months of uncertainty and anonymity, Miller's future has gone from secret to secure. His new route appears wide open.